The building is the first set of buildings on the right (Westwood Lake buildings...there are three, three story tan buildings). Take a right into the parking lot, go straight, and the building is the second building on the right (closest to the nature center). Suite 220 is on the second floor. Take 394 West of 100. Exit on General Mills Blvd. Take a Right on General Mills Blvd. Go under 394. Take a left on Wayzata Blvd. Take a right into the parking lot, go straight, and the building is the second building on the right. Go east on 394. Go past Hwy494 and Hwy169. Take a left on General Mills Blvd. Take a left on Wayzata Blvd (the frontage road). Right in Front of Westwood Office Buildings. There is a stop right across from our suite of buildings, inbetween Winnetka Ave. and General Mills Blvd. General Mills and Wayzata Blvd. (394 and General Mills Blvd.) There is a stop at General Mills Blvd. and Wayzata Blvd. It is about a block away, but you can see the tan buildings of Westwood Office Park from the bus stop. We are east of the bus stop on Wayzata Blvd. Winnetka Ave. and Wayzata Blvd. At Winnetka Ave. and Wayzata Blvd. (by the Holiday gas station), there are some buses that also stop there. You won't see the Westwood Office Park buildings from there. 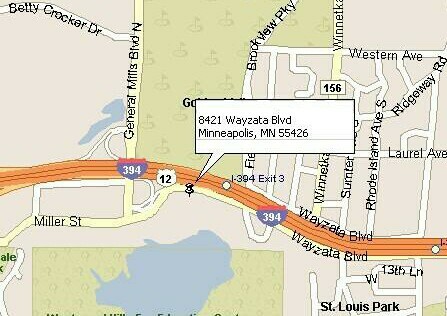 We are west of this stop on Wayzata Blvd. It is about 3-4 blocks to our office from Winnetka Ave. Note: There are not specific "blocks" in this area, it is our attempt to help you know how far of a walk it will be. There is a lot of free parking. On the west side of the buildings there is a free parking ramp, but there should be enough parking right in front of the building.